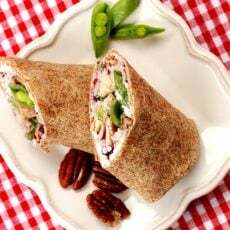 Any time of year is a good time to enjoy these scrumptious sliced turkey wraps made with cream cheese and cranberry sauce. 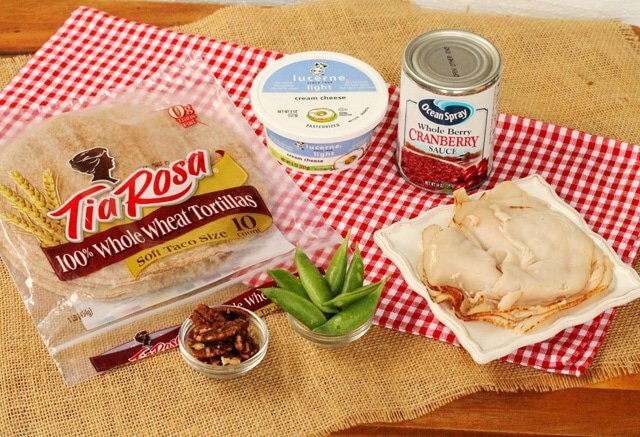 These wraps are made with whole wheat tortillas not only for the light wheat flavor but also because the brown color of the tortilla is such a pretty contrast with the ingredients when the wrap is cut in half for serving. 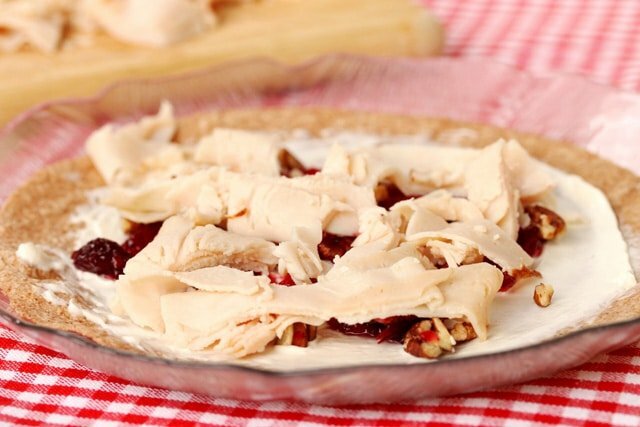 The sliced turkey tastes so good with cream cheese and the sweet tart flavor of the cranberry sauce in each bite. 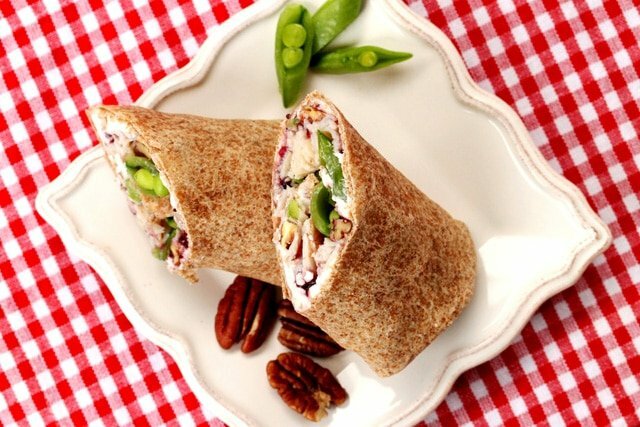 Crunch is also added to the mix in this wrap with chopped pecans and sugar snap peas in each bite. 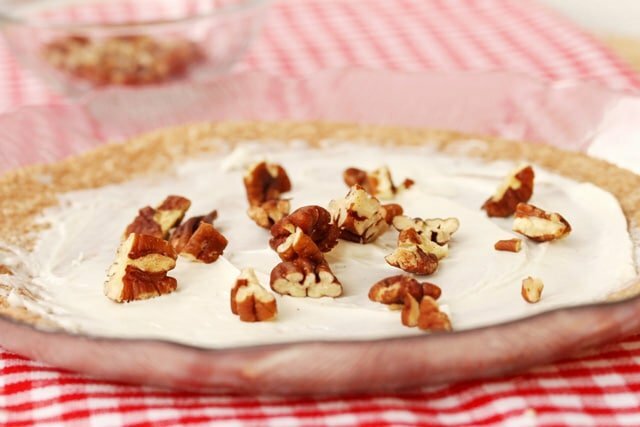 It’s light, full of flavor and tastes heavenly. 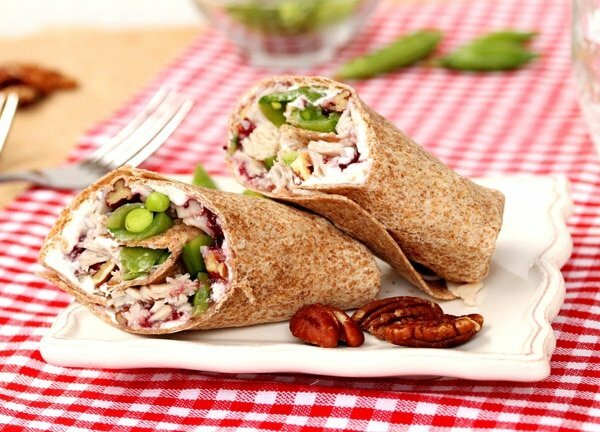 These colorful wraps make a delicious lunch, dinner or appetizer. 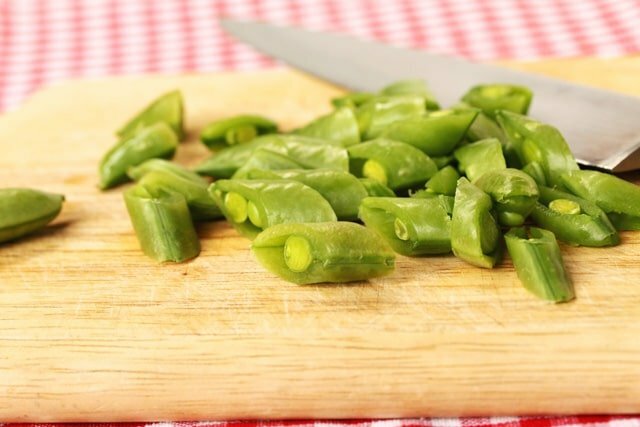 For the Filling – Cut the sugar snap peas on a diagonal into about 1 inch size pieces. 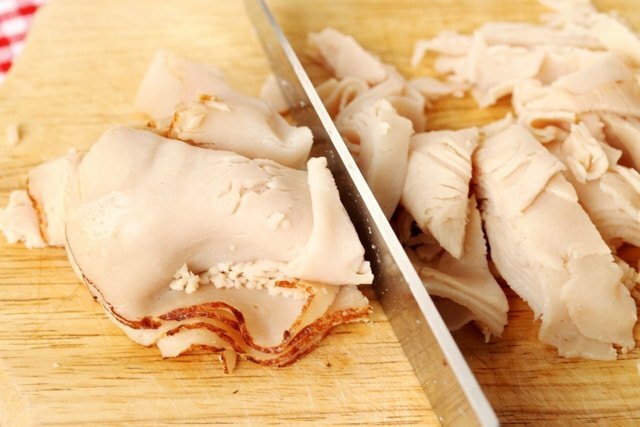 cut the sliced turkey into thick strips. 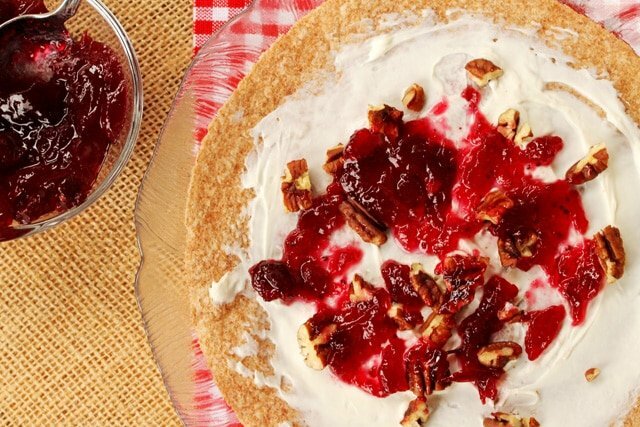 Spread the cream cheese on the tortilla. 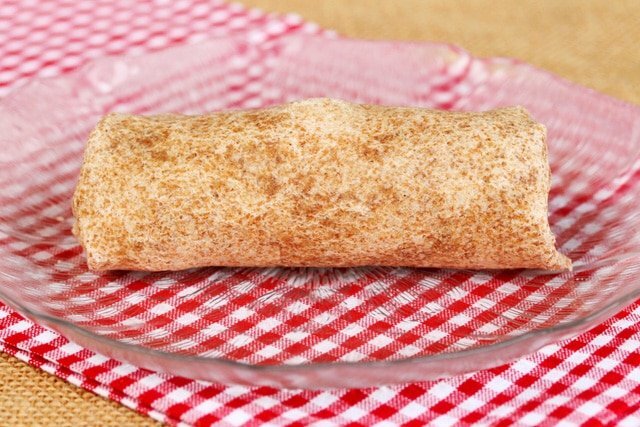 Rolling the Wrap – Fold the bottom edge of the tortilla about 2 inches towards the inside and over the ingredients. Then in the same manner, fold the tortilla edges to the left and right (of the bottom fold). Roll the tortilla starting from the bottom edge of the tortilla (like when rolling a burrito). 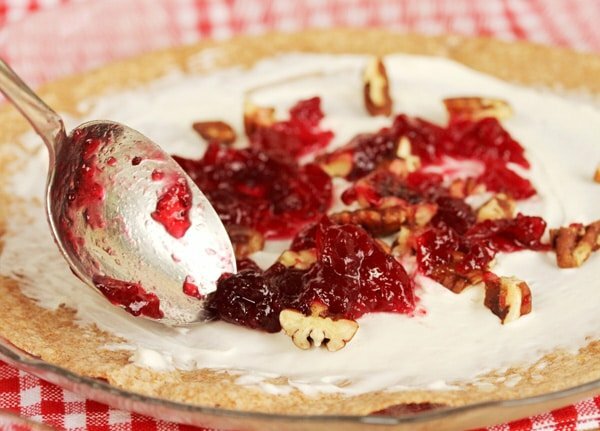 Slice the wrap in half on a diagonal and serve right away. 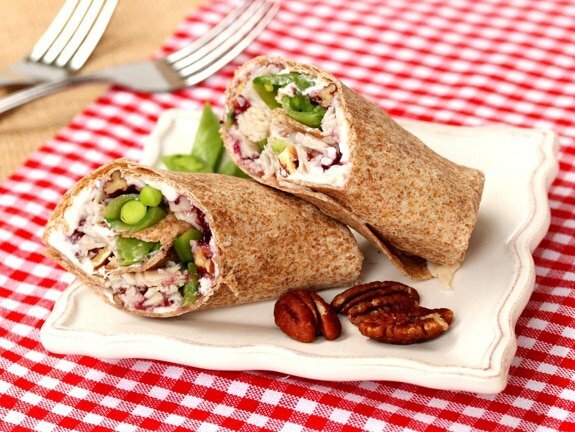 Or, make these wraps ahead of time, store in the refrigerator and serve chilled. Thank you so much stopping by CCC! 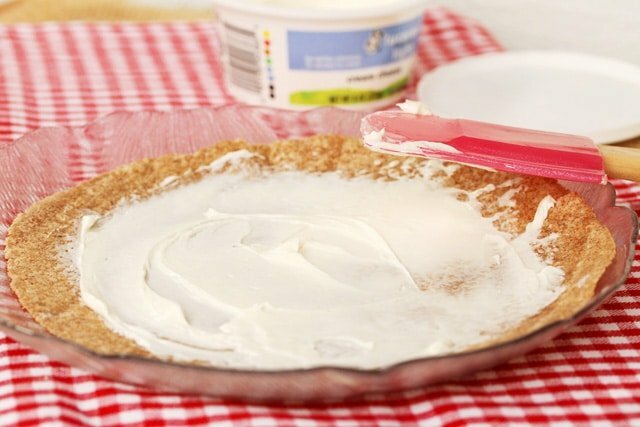 For the Filling - On each tortilla, spread cream cheese. 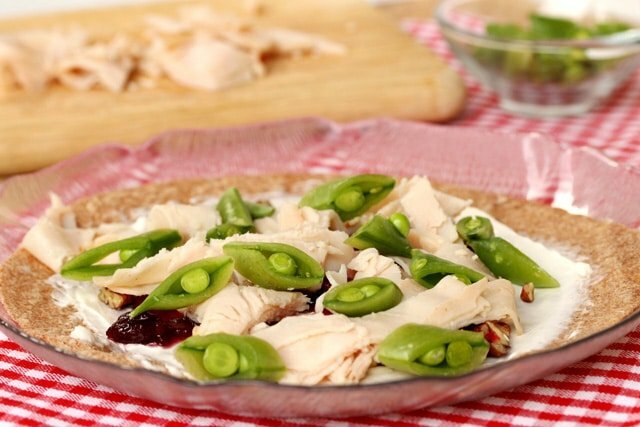 Top with jellied cranberries, pecans, turkey, and sugar snap peas. Rolling the Wrap - Fold the bottom edge of the tortilla about 2 inches towards the inside, and over the ingredients. Next, roll the tortilla starting from the bottom edge of the tortilla (like when rolling a burrito). Serving the Wrap - Slice the wrap in half on a diagonal and serve right away. 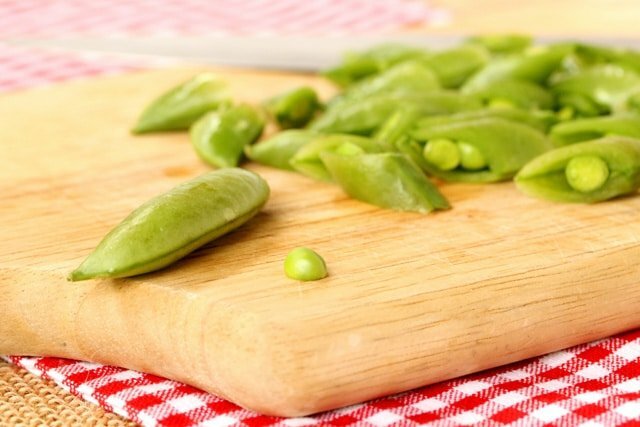 Or make them ahead of time, store in the refrigerator and serve chilled. Made your recipe, but used mini-tortillas. 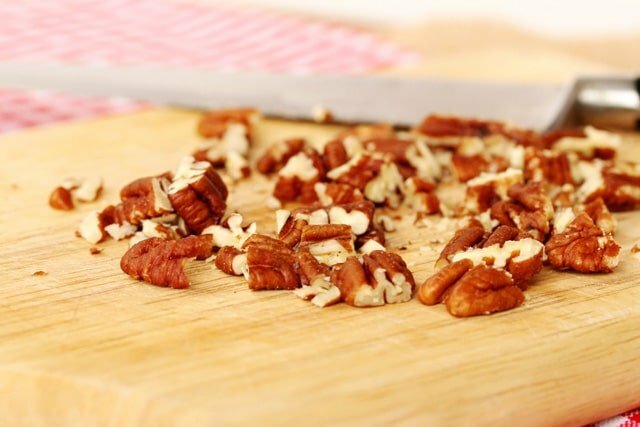 After filling these smaller wraps, I cut them in half, for bite-sized snacks to serve with drinks for a party. Perfect combination of tastes. 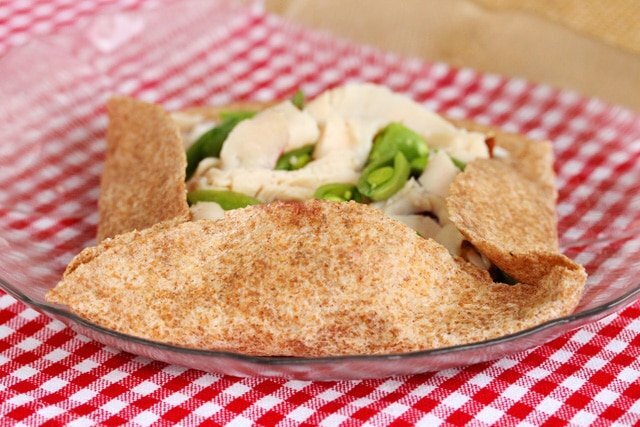 The smaller tortillas are harder to roll up unless the ingredients are cut up finely. It also helps to microwave the tortillas so that they are more flexible. 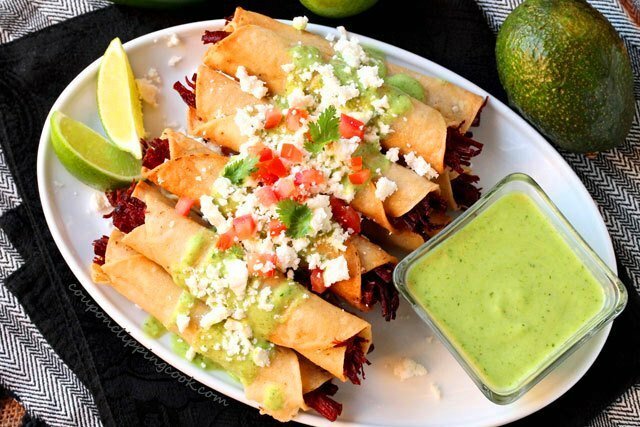 Hi Marsha, love the idea of making these with mini tortillas! And thank you for the tip on putting the tortillas in the microwave to make them more flexible.